Yes, I rearranged the way this post was structured. You will get to see the year’s roundup soon, but I wanted to highlight the finishes on this list, too. Renewed Jelly Roll Race Quilt: Finished 9/9/2012 YAY!!! Whole Cloth Quilt: Finished 10/5/2012 YAY!!! Flowering Snowball: Finished 10/31/2012 YAY!!! I came across last year’s end of year post and realized that I surpassed my previous goal of 9 quilts finished in one year last year when I finished 10 quilts. If I want to surpass another significant goal, I will have to finish at least 11 quilts this year. There is no hope for me now. Oh well, I did make a lot of progress on projects and that pleases me. I also had fun, which is the goal, right? The Tarts Come to Tea: I haven’t quilted on this since April 2011. I really do need to work on the quilting. I was making good progress and then got sidetracked. Quilting the Whole Cloth quilt sort of got me back in the swing of quilting, so perhaps there is hope for this piece. Garden: I started this piece in a class with Pamela Allen in 2006. I also used this piece for my beading demo for the 2012 EBHQ Voices in Cloth show (March 17). I made the facing and started to stitch it down. After stitching down the facing, I need to make a sleeve and finish about 2″ of blanket stitching that I noticed wasn’t complete. Spiderweb: Top is together, binding is made. I am working at ripping out the foundation paper (what a pain and what a mess!). I need to make a back and then take it to the quilter. Young Man’s t-shirt quilt: have cut up the t-shirts and am still in the process of applying fusible. He cleaned out his drawers and found some more t-shirts to add to the quilt. Oh Yay! <– just a bit of sarcasm. He asked me again for another quilt, so I think this one is next in line. I plugged in his heating mattress pad, though, which should keep him quiet for a bit longer. I still have a few more WIPs than I do finished projects. Again, I have made progress on clearing out old projects and I am pleased. Original Bullseye: Top and back are finished. Needs binding and quilting. I think loopy feathers quilted in the border will set off the blocks fine. Stepping Stones: at the quilter, made binding, which she will sew on for me and then I need to stitch down the binding. Corner Store: Finished quilting the middle and am preparing to work on the borders. Infinity blocks: blocks sewn together into a quilt top, borders on. Back and binding made; ready to go to quilter. A-B-C (A-Z) BAMQG Challenge – top finished, back and binding finished. Ready for the quilter. Flower Garden: The flowers were too spiky. This is going to Pam for a cat bed. Pineapple: will remake blocks at a later time with more care. 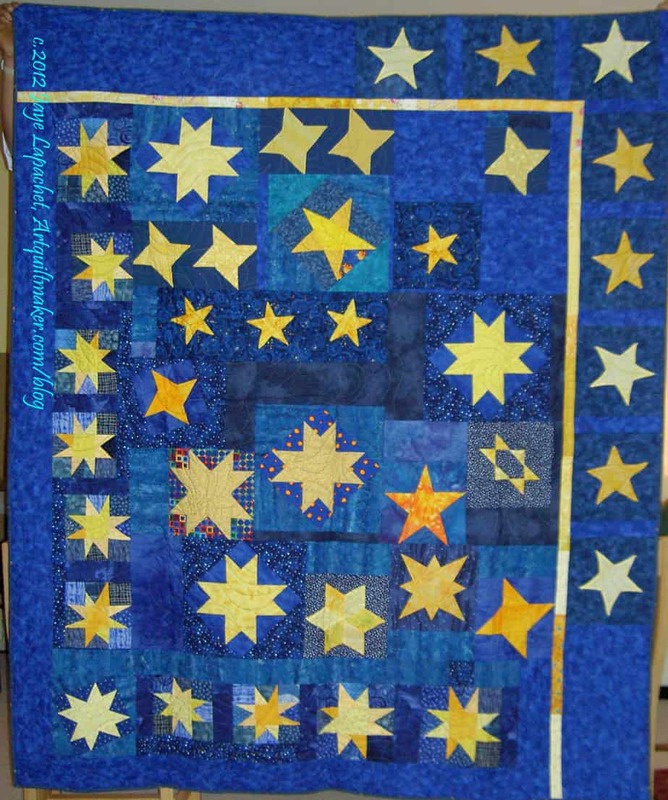 Moon and Stars: This quilt was barely a quilt and was not interesting. I realized I didn’t want to devote time to it. So, I finally just decided to give up and get it off the list. I will send it to Pam for a cat mat. Spin Wheel: really not started, but supplies gathered. Cutting fabrics as I go. TFQ does not consider this a UFO and made some good points to that end, which is why I have moved it to the Hunting and Gathering section. She says, and I have to agree, that quilts are not ‘projects’ until the sewing starts. OK. I’ll go with that. Windmill quilt: Still hunting and gathering. Stepping Stones #2 using Bonnie & Camille fabrics Bliss, Ruby, Vintage Modern: made two blocks, but still on back burner while I decide on the background colors. I am pretty pleased. I have 8 projects off the list and 9 others with a definite plan. I am still mulling over whether I want to continue this update into 2013. 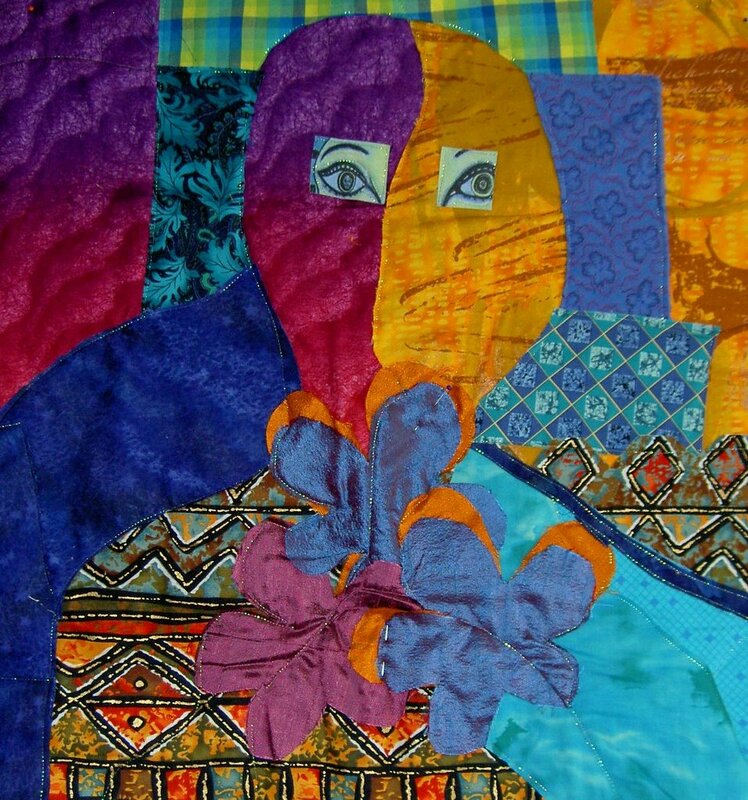 I, of course, want to create some kind of disposition for all of the quilts and projects on the list. However, I do want to think of a new focus for 2013 and I don’t want it to be the same focus year after year. Stay tuned while I decide. Wow, you got a lot done this year! At first glace that list never seems to change, but you’ve been whittling away at it. Probably more important are plans for the other projexts, and turning some loose. Cats do need beds, after all. Chaining ourselves to finishes really limits our creativity. Have a great new year!